President and Vice President of John Cannon Homes, Inc.
John's industry experience is a comprehensive blend of educational knowledge and practical implementation; he graduated from Michigan State University with a Bachelors’ in building construction and relocated to Sarasota, Florida to work for a national builder. 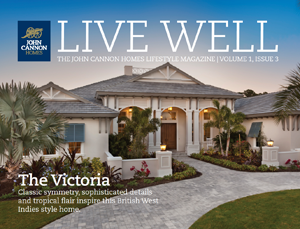 After years of perfecting his skills, he pursued his dream to design and build custom, luxury homes under his own name and founded John Cannon Homes, Inc. with his wife, Phillipa. thirty-one years later, his unwavering commitment to quality product and service excellence sets the “gold” standard for the custom home building industry in our area today. From the beginning, John and Phillipa each brought their strengths to the organization. John had the expertise in building and Phillipa’s background in banking provided a solid financial foundation. Today, as the company's vice president she oversees all financial aspects of client contracts and works with their lending institutions to ensure a pleasant experience. With over thirty-five years in real estate development and construction, Mike, John Cannon’s CFO, is responsible for all facets of the company's accounting and finance functions. Mike is also responsible for the company's land acquisition and development function, ensuring that the company has an ample supply of homesites in outstanding communities. Darrel has been in the design and construction industry for over 27 years and has worked on projects in 14 states. As an owner of a design firm for over 14 years, Darrel’s experience in both commercial and residential projects includes design, project management, estimating and procurement. As Director of Architectural Design and Drafting he is responsible for new home design, structural design, engineering, permitting and development and state/ local governmental approvals. Born in Watertown, New York, James (Jamie) O’Driscoll attended the State University of New York Institute of Technology at Utica where he graduated with his B.S. majoring in Computer Engineering. After relocating to Bradenton, James took a job with a new start-up technology company as the Sr. Network Engineer. This company quickly blossomed into one of the premier technology companies on the west coast of Florida. In February 2004 O’Driscoll joined John Cannon Homes as the Director of Technology where he has aligned them to be at the forefront of technology. In addition to his roles as Director of Technology, James heads up the Customer Service and Warranty divisions. James has over 18 years in the technology industry and 14 years in the construction industry. Tim has been in the construction industry for over 20 years, managing a vast array of projects, from restaurants and retail to high-rise condos and luxury, custom homes. As Chief Operating Officer, Tim oversees the daily operations at John Cannon Homes to ensure that every customer is satisfied with their investment and to plan and achieve the company's long-term goals. Tim has built a first-rate team that works well together delivering the high standards set by John Cannon Homes. With over 15 years with John Cannon Homes, Mark’s relentless attention to detail and his unwavering dedication to customer satisfaction serve him well in his role as Director of Sales and Marketing. His expertise and vast knowledge of the industry has helped countless clients create homes that meet their unique specifications as well as their budgetary requirements. His team driven commitment, skills and capabilities and proven track record in sales and marketing make Mark an integral component of the John Cannon Homes management team.